Do you know what you’re getting all your dog friends for Christmas? We spend a ton of times with dogs, as you can image. 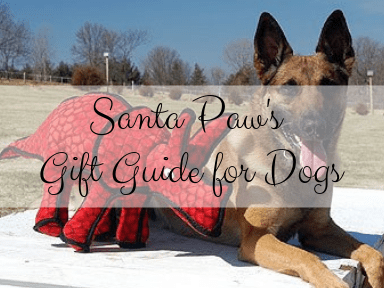 Here are few of the more popular fan favorites for your furry friends this Christmas. 1. The Kong by Kong from XS to Kingsize. The Kong toy is a lifesaver for owners who’s pets may have separation anxiety, or barks when the owner leave, or is a major chewer!! Its a hollow snow-man-ish shaped super durable chew toy that the owner can fill with an assortment of goodies! A great way to use it is to mix dog kibble with a bit of melted peanut butter (don’t use peanut butter if your pet has a peanut allergy) in the case of peanut allergy used hot water to soak dry kibble in. Then you fill the Kong, then you FREEZE it!!! It takes them so much longer to work at get all the tasty treat out. It gets a 2 paws up. What’s more fun than chasing squirrels at the park? Chasing squirrels at home, of course! Now there’s a toy version of your pup’s favorite pastime. Just stuff the squeaky squirrels in the soft tree trunk, and watch your dog pull them out one by one. To keep the game going, just stuff them in again and again. These squirrels love to play!! It also comes in a bee and bird model. Tuffies toys claim to be the worlds “Tuff”est soft dog toys by VIP. Chewy, stuffed toys so durable, each one receives a toughness rating from the manufacturer. They have multiple sizes and designs with multiple price ranges. IQ Treat Ball is a fun and clever way to stimulate your pup’s mental and physical health. Simply pop a treat in the ball, select a difficulty level and let ‘er roll! Your puppy will love rollin’, chasing and playing with this ball before getting rewarded with the yummy treat inside. These are just a few of the many different canine toys out there on the market. I hope you enjoyed the list. May Santa Paws bring all legged canines in your family awseome gifts!! If you can’t travel with your pets for the holidays, book a pet sitter. Give us a call at 201.446.1559 or email us at bark@trustytails.com. We’re here for ya.